1. What is the observed insight? Kids usually don’t like using sunscreen: it takes time, it’s annoying, the product is sticky, they don’t understand how important it is to use such products and they don’t know of the dangers caused by a prolonged exposition to UV rays. 2. What is the behavioural challenge? 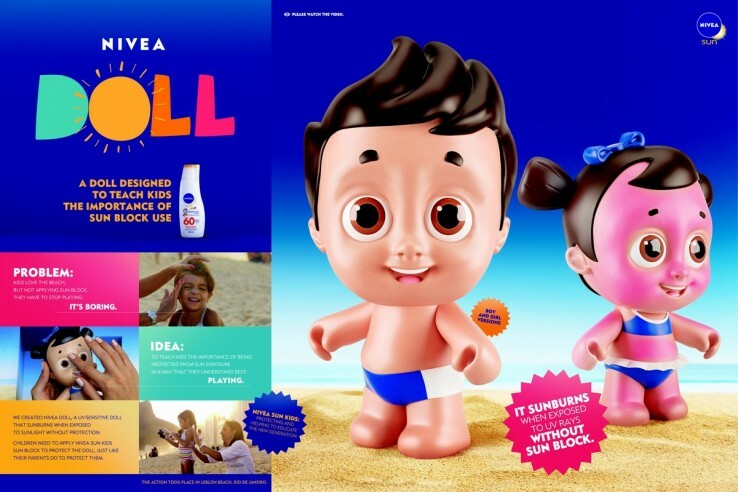 NIVEA is looking to encourage the use of sunscreen both by parents and kids. To engage them in such a voluntary use and make it a family ritual, NIVEA has to raise awareness about skin care and trigger the specific drivers that will improve the kids’ behaviour. 3. Why should we embrace it? About 182 000 new cases of skin cancer were expected in Brazil in 2014. This represents around 30% of all new cancer cases in the country. Children’s skin is particularly vulnerable. As a skin care products manufacturer, NIVEA can step up and help protect people against those health issues and allow people to spend time in the sun with their loved ones well protected. PRINCIPLE: NIVEA´s nudge aims at helping kids realize the dangers of UV rays by materializing them, at the right time and the right moment. It also aims to establish a new habit through role play. NIVEA uses entertainment to raise the kids’ awareness on how sensible their skin is and therefore how important it is to take care of it. Role play committed them into healthier behaviours and new rituals. The nudge was carried at a salient and framed time. EXECUTION: The brand produced dolls with a skin designed to react like a real human’s: the doll’s skin gets sunburned when exposed to UV-rays without protection, and needs sunscreen to stay healthy. The doll was distributed on a number of beaches in Rio de Janeiro. Designed like any usual toy dolls, the little characters had to be taken care of by the children (like their parents take care of them, hence the role-play). The operation carried in Brazil was a first test that received positive reactions, which underlines a certain potential for use at a larger scale. NIVEA gained brand equity in the process. Evaluation in progress.